The “new” 16’x28′ greenhouse (2008) in early spring of 2010. Note the roll-up side on the left. These raised beds are mostly filled with salad-y stuff, but kales, cabbages, leeks and garlic are also visible. I am a year-round vegetable gardener but I could not do it without my greenhouses. I have two sixteen-foot wide structures (high tunnels, hoop houses, polytunnels, etc. ), one that is 20′ long and one that is 28′ long. They are easy to erect with minimal skills; you could assemble one over a weekend if you had help. I purchased mine as kits (plastic, hoops, plastic hold-downs, bracing, etc.) but I supplied the lumber for the base frame and the end walls. I also made the doors, but you could easily use a wood-framed screen door. 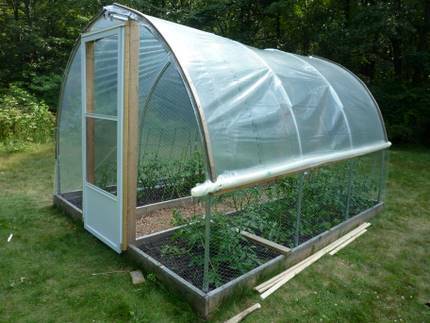 All in all, the larger greenhouse was about $1,000 and the smaller one $850. If I amortized about how many $5 bags of organic salad I have pulled out of them (not to mention heirloom tomatoes or any other thing I grow within them in a calendar year), they easily paid for themselves within one year. The plastic is UV-stabilized commercial greenhouse grade stuff that lasts six years. Recovering one of them will cost about $200. I have a roll-up side to allow for ventilation in the in-between seasons (spring and fall). In the high summer, I take the plastic off of the door sections on both greenhouses. Because I have often-errant chickens and I hate tomato hornworm moths, any open space is covered with screen (in most instances, deer netting with 3/4″ square holes). No, I do not heat the greenhouses. They do quite fine on their own in the winter. I grow frost-tolerant plants in there (lettuces, mache, claytonia, arugula; all onion-family plants (though chives do a swan dive); escarole and endive; the cabbage family; and many root crops (carrots, beets, parsnips, turnips, and the like)). I grow all my garlic in the greenhouses. I cover the beds with agricultural cloth (Reemay) that allows light and keeps things a touch warmer than not. On a sunny day, they can get quite warm (80 degrees F or so) but mostly they’re simply 20 degrees warmer than the world outside. In my Zone 6B garden, twenty lousy degrees is quite a difference. And in summer, the solanaceae crops do quite well in there (tomatoes, peppers, eggplant, etc. ; also heat-loving okra, asparagus, cardoon love life indoors). Summer is likewise the only time I tend to have to water the beds. There is usually a one or two-week period in high summer that it is REALLY hot, and the plants don’t set flowers. If I lived somewhere warmer, this would be a problem and I would invest in shade cloth. As it is, I appreciate the break. I also built a greenhouse for my mom in the spring of 2010. It’s a small (10’x12′) kit from Growers’ Solution where I also got mine, see the links below. I got my greenhouses as complete kits from Growers’ Solution, which makes their own frames. Four-Season Harvest by Eliot Coleman. Not just greenhouses, a must-have book! The Winter Harvest Handbook by Eliot Coleman. More information! Great for small farmers but good for backyard growers too. There are lots of other ways to have your own greenhouse. 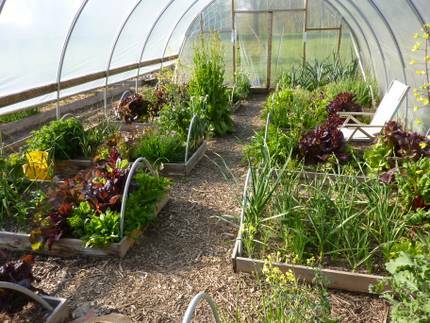 Google “Hoop House” and watch the results turn in. Here’s a decent site though to build one out of PVC. Johnny’s Selected Seeds sells tools to bend your own conduit or chain-link fence parts to make your own greenhouse. Eliot Coleman also has a demo on MOFGA (Maine Organic Farmers and Gardeners Assoc.) on how to build a low tunnel (a short greenhouse) to help season extension.